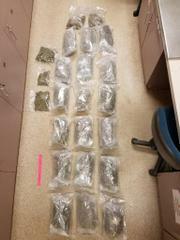 In the early morning hours of Thursday, May 3 2018 Officers of the Green Bay Police Department’s Community Police Unit, with assistance from the Brown County Drug Task Force performed a search warrant at 411 S Maple St on Green Bay’s near west side. Officers were acting on information of potential drug sales from the location. 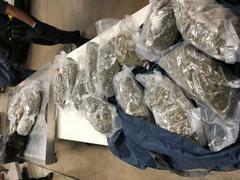 Seized from the address was over 20 pounds of marijuana, with an approximate street-value of over $70,000. Also seized was over $7,400.00 in cash and two firearms. In addition, Brown County Child Protective Services was contacted for young children living in the home. The residence is located across the street from Seymour Park. If anyone has information on this case they can call the Green Bay Police Department at (920) 448-3208 reference case number 18-202928. You can remain anonymous and may be eligible for a reward by contacting Green Bay Area Crime Stoppers by phone (920) 432-7867, through their website at www.432stop.com, or by downloading the P3 app through Google play or App store.